Halloween is easily my favourite holiday. I've always been drawn to the spooky side of life & it's a whole lot more fun than any other annual occasion. I love dressing up, decorating the house & handing out sweeties to trick or treaters. Rather than going out for a party this year we're just gonna stay in and watch some classic movies. 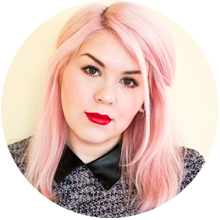 I'm thinking Hocus Pocus, The Craft & Ed Wood. Tonight along with my pumpkins I'll be lighting this limited edition Halloween candle from Flamingo Candles. 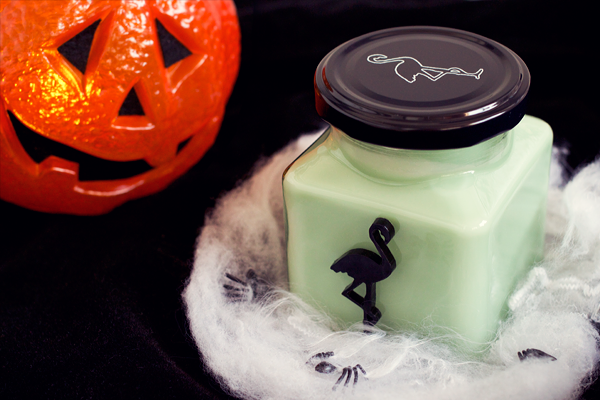 For Halloween 2014 Flamingo Candles have brought out a special trio of fragrances complete with three spooky colourways to complement your creepy decorations. The three candles available in this range are Aniseed, Orange & Nutmeg and Cinnamon Appleberry which is the one I that have here. The minty green EcoSoya soy wax is the perfect colour match for witchy face paint and the black Florrie flamingo adds to it's ghoulish appearance. The scent of this candle is described as a 'delicious blend of tart, juicy apples and sweet strawberries, raspberries, and blackberries laced with a cinnamon glow'. It's an incredibly yummy & fresh combination. If you're a fan of crisp apple scents then you will absolutely love this candle. Earlier this month I reviewed Flamingo Candles' Applecurrant Crumble candle and although they're both apple-based scents they couldn't be any more different. Cinnamon Appleberry is a lot sharper & fruitier whereas Applecurrant Crumble was very sweet & comforting. This candle still has a hint of sweetness though which nostalgically reminds me of Atomic Apple flavoured Hubba Bubba and toffee apples, one of my favourite treats at this time of year! The addition of spicy cinnamon is very warming & makes me feel all cosy inside. It'll carry through nicely into the Winter as well as the spiciness is somewhat Christmassy. With up to 50 hours burn time it'll probably last you that long anyway! It has great scent throw which beautifully fills the room. I really like that these organic hand-poured candles use soy wax and natural cotton wicks as they burn very cleanly. They won't leave any random bits of soot around your home & they're non-toxic so they're much better for you as well. Although this candle is from the Halloween collection there's nothing stopping you from burning it at any time. Cinnamon Appleberry is another wonderfully Autumnal scent from Flamingo Candles & would make a lovely accompaniment to any cold dark night. I'm not sure how much longer the Halloween collection will be available for so I would suggest ordering soon to avoid disappointment. Happy Halloween everyone! I've always adored Flamingo candles, and looks like this one would be no different. Although I wouldn't expect it to be green for some reason!